Welcome to Sebring! The field didn’t make it through the first corner before the front runners ran into each other. 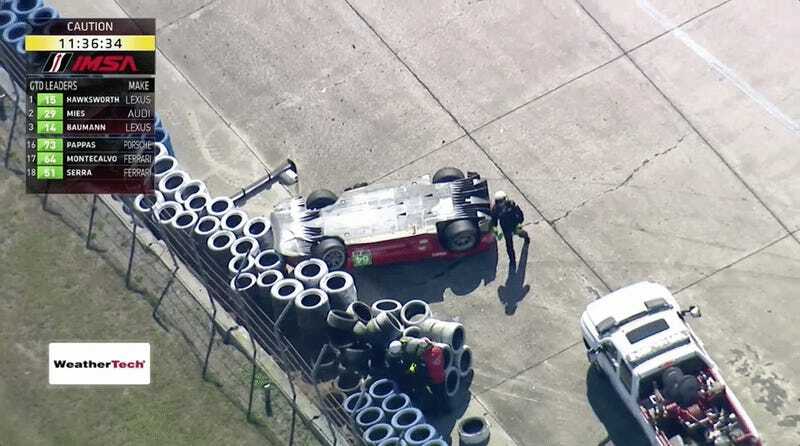 Then just 20 minutes in, there was a rollover, making this race about a wild as you would expect from the land of the Florida Man. New lap record holder and 12 Hours of Sebring pole sitter Tristan Vautier went a bit wide in the No. 90 Spirit of Daytona Cadillac into Turn 1—and into the rear wheel of Olivier Pla’s No. 2 Tequila Patron ESM Nissan. The No. 2 slid into the dirt outside Turn 1 as a result, and the incident was jarring enough to the car’s gearbox that they rolled it behind the wall. To say that’s disappointing for the car that started second for the race would be a massive understatement, and the only folks whose day might come close is the Scuderia Corsa team. Poor No. 64 Scuderia Corsa Ferrari 488 GTE driver Frankie Montecalvo found himself upside-down just twenty minutes in the race after Sebastian Saavedra’s No. 52 AFS/PR1 Mathiasen Motorsports Ligier spun. The No. 52 clipped the tire of the Ferrari, sending it airborne and straight onto its roof. Montecalvo was fine, however, the car is not. It appears to have some rear suspension damage as well as some possible steering damage. It’s also missing its rear wing, which flew right off in the incident. Scuderia Corsa says they’ll try to repair the car back in the garage, because why not? It landed hilariously cleanly in the slow roll on its roof. These big moments were all just in the first thirty minutes of the race, and we’ve got around 11 and a half hours to go. Good morning! Hope you’re awake. UPDATE [1:45 p.m.]: Montecalvo has been checked and released from the infield medical center, however, the No. 64 has been retired, per Ferrari.